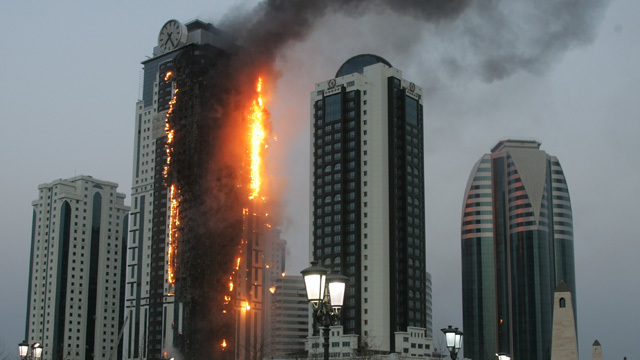 Moscow's residential Olympus Tower was engulfed in flames last Wednesday, requiring a massive effort from 300 firefighters to bring the blaze under control. Debris could be seen falling from the 475-foot high building, but no serious injuried were reported largely in part to the tower's lack of occupancy. One of the tower's more notable part-time residents is actor Gerard Depardieu, who was given a five-bedroom apartment as a gift for gaining Russian citizenship by Chechen leader Ramzan Kadyrov. With the building nearly completely destroyed, it looks like he'll need to find a new second (or third, or fourth) home. It's not often that we see highrises ablaze like this, and the striking thing here is the fact that the 150,000 square feet of the building burned the way it did, despite leaving the core structure largely unaffected. Aside from the World Trade Center, the only major structural fire involving a skyscraper that comes to mind is that of Philadelphia's former One Meridian Plaza, which was destroyed in 1991 by a fire that occupied eight full floors. So what was the main culprit here? Well, the fire is being blamed on an electrical short circuit, but the thing that stands out is the fact that the building's exterior was covered in plastic trim, which clearly proved to be highly flammable. It doesn't seem like a sound idea to cover a massive structure in what essentially acts as kindling. If anyone has some information on more buildings around the world that feature plastic trim on the exterior, please let me know in the comments. I'd love to research this a bit more.